Closed the rest of the year but open for announced groups. We have a special winter events many weekends during November, January, February and March. Guided tours and educational proporsitions by appointment. Adults (18+) 120 kr. 45 kr. Student (with current student ID) 85 kr. 45 kr. Youth (Ages 5-17) 70 kr. 30 kr. Pupils / teachers 50 kr. / 25 kr. 20 kr. / 15 kr. Life at the mill: Adults (18+) 60 kr. / Child (Ages 5-17) 30 kr. Guided tours and educational propositions by appointment. 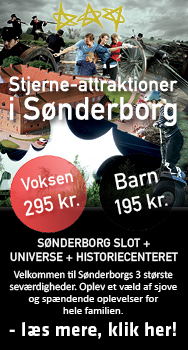 Season ticket: adult (18+) 220 kr. / child (ages 5-17) 120 kr.